Gulbarga region of modern Karnataka state was once a great center of Jainism due to patronization by imperial dynasties monarchs and movement of Jaina preachers among laymen. Rashtrakoota monarchs along with their feudatories followed Jainism and constructed many great pantheons of which some are also evident today and some were appropriated, encroached and converted during hurricane of other faith. Tadkal :- Tadkal village is situated about 52 kilometers apart from Gulbarga in North East direction and about 18 kilometers from Aland town. The village is renowned for ancient Shantinatha savior temple along with some ancient Jain vestiges of Rashtrakoot and Chalukyan period. The temple of Lord Shantinatha is situated in the middle of the village and now celebrated as Atishay Kshetra in laymen. In the front of the temple a Maanstambh is erected. 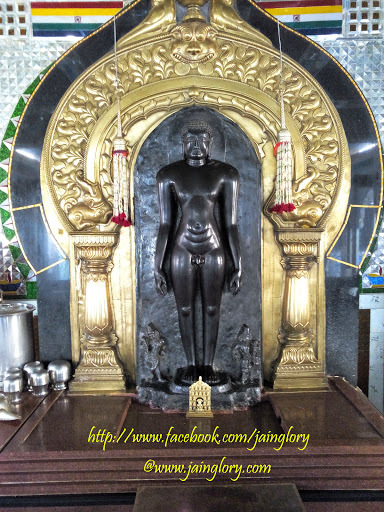 The temple contains principal deity of Lord Shantinatha sculpted in black stone and hailed from 9-10th century AD. Lord Shantinatha is depicted in kayotsarga posture and has height of about 3.5 feet. Lord Shantinatha is flanked by two whisk bearers and complete sculpture is decorated by modern golden work. The central vedi consisting ancient Shantinatha sculpture is flanked by two other vedis containing some later century’s sculptures. On the left side of main vedi there is a vedi consisting white stone images of Lord Parshwanatha of later medieval centuries. On the right side of main vedi there is a vedi consisting white stone sculptures of Jina saviors of later medieval centuries. Image of Saraswati or Srut Devi :- An image of Devi Saraswati or Sruta devi is depicted in a separate vedi situated at outside of inner temple. The image is depicted with four arms consisting of mala, pustak and pasha. On the bottom of pedestal a peacock is carved beautifully and goddess is seated in Padmasana posture with serenity and tranquility on the face. The ornaments of goddess are carved minutely and seem very gorgeous. The image is a masterpiece of Chalukyan art and rarely found.